The Planet Waves Solderless Pedal Board Custom Cable Kit is a custom kit designed for pedalboards featuring 10 feet of cable and 10 right-angle plugs with a mini cable cutter. This kit is the perfect solution for wiring custom pedal boards and rack gear, allowing you to customise your cable lengths and plugs. The components are low capacitance for pure signal transparency plus the 24k gold-plates plugs improved signal flow, resulting in the best signal quality possible. The solderless plugs will connect to cables within seconds, allowing you to create exact lengths with ease. With the Planet Waves Custom Cable Kit you can customise your pedalboards cables and cut them to your desired length with ease. 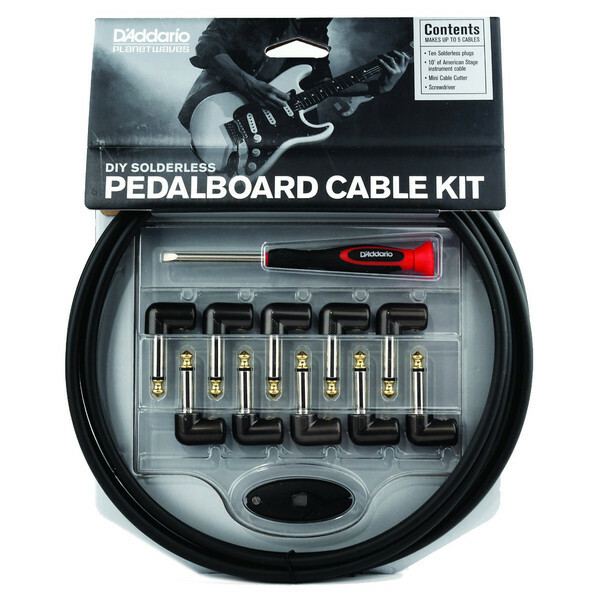 This kit is the perfect solution for custom wiring pedal boards and rack gear, eliminating any messy cables or excess length that can prove problematic in live situations. Customising your cables is easy, simply cut the cable to your desired length, screw in the plug and you’re finished. This straightforward process makes customising and maintaining your cables easier than ever before. The cables themselves have a low capacitance for pure signal transparency as well as 24k gold-plated plugs for improved signal flow and resistance to corrosion. Combined, these components deliver exceptional audio quality as well as being highly durable, perfect for extensive live use.